Weight Loss Wednesday: Goodbye Summer?! Home #WeightLossWednesday Weight Loss Wednesday: Goodbye Summer?! Welcome to the Weight Loss Wednesday Linky – where you can share fitness, weight loss and healthy eating posts and recipes. I quite like lemon drizzle cake, so if anyone has a recipe for a calorie free cake, that would be awesome! I am not going to bleat on today… I am on day 4 of the New You Plan shakes and am quite irate. I am feeling pants with a sore throat and cannot take anything for it, the only real downside to a VLCD. All was going well until Friday – at 5am to be precise when I arose to the eeriest feeling ever. After the result and attending our local with our councillor friends only meant one thing… a pint. That set the tone for the evening and for Saturday too, with my motivation somehow making itself known on Sunday to crack on and lose the final stone and a half. Being surrounded by friends who do not fully understand a VLCD does not help. Trying to explain that the short term disadvantages are totally outweighed by the long term gain does not seem to help. However in another couple of weeks, if I can stay away from temptation and keep my summer wardrobe in mind, they will be able to understand. Though currently I am picking items from my Winter Wardrobe to wear due to the weather which are hanging off me. So much for a summer wardrobe! Enough of me moaning about everything – how are you getting on this week? Are you concentrating more on actual weight loss this week or the fitness side with toning up? Do you have a summer incentive to work towards? If you would like to feature the #WeightLossWednesday badge, please take this code! Don’t forget to tweet us! 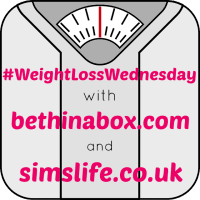 @SimsLifeBlog with #WeightLossWednesday!